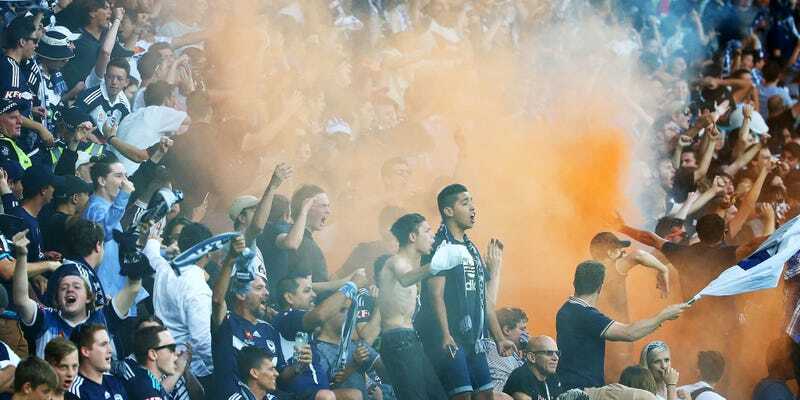 Early reports out of Australia have last night’s/this morning’s Melbourne Derby down as one of the greatest ever meetings between Melbourne City and Melbourne Victory, and the tape backs that up, inasmuch as it’s the only A-League I’ve ever watched, and there were some good highlights. The finish on City’s first goal is fine, but look at Bruno Fornaroli’s gorgeous pair of turns to escape pressure, capped off by a wonderful rabona to get it out to the wings. The Victory would equal things up just a few minutes later with this weird, long-range chip. And, then, controversy! After a pair of less highlight-reel-worthy goals to make it 2-2, Brazilian Gui Finkler swerved this free kick in off the bottom of the crossbar, but it was disallowed by officials. As you can see, it’s clearly a goal. Maybe this is one of those Australian things where the ball spins backwards out of the net, instead of inwards? Either way, it ended 2-2, but only after fans threw flares and bottles on the field, and Anthony Caceres got a red card for a dangerous tackle. The A-League seems cool.